Starting January, 2011 only Customers with a current Maintenance subscription will receive direct technical support from Black Ice Software. Black Ice Software® announces the release of version 8.40 of the Tiff Viewer & Browser Plug-In and Tiff Viewer Server application. 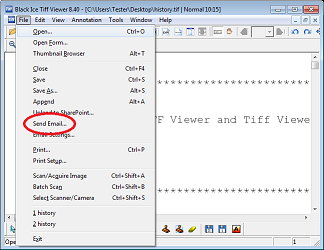 This latest version of Tiff Viewer is capable of sending the TIFF document as an email attachment right from the Tiff Viewer or the Browser Plug-In user interface. The new Tiff Viewer email feature can be configured to use either the default mail client (e.g. Outlook or Thunderbird) or a custom SMTP server for sending messages. SMTP connection and SSL encryption can be specified as well. Emails can be sent silently in the background to predefined recipients. When emails are sent silently, log files can come in handy to check the status of sent messages or error messages. The new email sending feature is also available in the Browser Plug-In. This newly added email feature of the Tiff Viewer Browser Plug-In will streamline user experience, since it will allow emailing of TIFF document directly from the browser plug-in. Mozilla Firefox and Google Chrome users can also email TIFF documents directly from the browser. See how Firefox an Chrome can be configured to use the Tiff Viewer Browser Plug-in. Terminal Server users can also use Tiff Viewer as a Document Viewer. Tiff Viewer Server is designed especially for Terminal Server environments. Terminal Server users can view, print, email and annotate any TIFF image, or to open and view TIFF files through the standalone user interface or with the browser plug-in. Tiff Viewer Server supports all Windows Server operating systems and Citrix on both 32 and 64 bit platforms.